RRB JE Recruitment 2019 Notification: Apply Online For 14033 Junior Engineer, Depot Material Superintendent (DMS), Chemical & Metallurgical Assistant (CMS) Vacancies, after checking the complete details in the Official Recruitment Notification. Now, the officials of the Railway Recruitment Board are very particular and asking some Requirements, which the applicants need to have at the time of applying. So, check them all. And then go on to submit the application form in the prescribed format. Apparently, 31st January 2019 is the closing date, by which the contenders have to submit the correctly filled application form. Well, the Last Date for the Application Fee Payment is different i.e.., 5th February 2019. Here is a great chance for all the people, who are searching for the Railway jobs. So, use this chance wisely by applying for it before the final date. Railway Recruitment Board Officials gave total details about the Requirements and application procedure in the official Railway Recruitment Board Junior Engineer Recruitment 2019 Notification. Therefore, if you are searching for the Central Government Jobs, then this is for you. All the Candidates must remember that they need to have all the Qualifications correctly, at the time of applying. If not all such applications will be rejected. Now, the officials of the Railway Recruitment Board are looking for the Candidates who completed their Degree in Engineering, B.Sc, BCA From any Recognized Institute or University in India. Now, the contender’s age must be between 18 years to 33 years. Well, for Age relaxation, candidates can check the RRB Junior Engineer Recruitment 2019 Notification. Well, the following are the selection rounds, that an individual has to clear to get placed in the available positions. Start the application form by going to the official site of the Railway Recruitment Board on 2nd January 2019 at indianrailways.gov.in or You can visit the RRB Site of your Region Accordingly. Over there you will find the advertisement for Junior Engineer, Depot Material Superintendent (DMS), Chemical & Metallurgical Assistant (CMS) Vacancies. Hope the total information we provided about the RRB JE Recruitment 2019 is helpful for the Job searchers. Share this information with your Job searching Friends too. Also, check our site Freshers Now, regularly. Waiting to apply for RRB JE Recruitment 2018-2019? Then you have to wait few more days. Because the Railway Recruitment Board is seriously planning to release the RRB Junior Engineer Recruitment 2018-2019 Notification. So, all the aspirants those who are ready to apply for Upcoming Junior Engineer Posts 2018-2019 can grab the valuable information such as Application Fee, Online Application Details, Application Form, Education Qualification, Age Details, Age Relaxation, Selection Procedure, Pay Band etc from the below sections. Moreover, to give the depth information we have also shared the direct RRB JE Recruitment 2018-2019 Notification at the end of this post. Therefore, all the interest and willing people need to apply only through Online Mode before the Final date. Well, those who are ready to apply for RRB JE Recruitment 2018-2019 need to refer the entire Notification very carefully. Everyone knows that the competition for Railway JE Jobs 2018-2019 is very heavy. So, you have to refer and apply as early as possible before the closing date. Actually, the Railway Recruitment Board has not yet finalized the Starting and Ending Dates to apply for RRB Junior Engineer Posts 2018-2019. Moreover, you have to apply through Online Mode. Soon we will active the Online Application link at the beneath of this article. Until we suggest the job seekers follow the entire article and clutch the detailed info. As per the latest news, most of the people are showing interest in Junior Engineer Vacancies. So, you have to visit the official web portal of RRB @ indianrailways.gov.in frequently. So, by checking the above table, you can easily find the minimum details related to RRB JE Recruitment 2018-2019. We all know that every year a huge number of job seekers are looking for Railway Jobs. So, getting a place in the Railway Department is very difficult one. While applying the RRB Junior Engineer Recruitment 2018-2019 aspirants must and should have Minimum 18 Years and Maximum 32 Years. Therefore, all the candidates need to satisfy themselves with the Age. Also, one more good news to the people is there is an Age Relaxation for some categories. We are not sure about how many years the Age Relaxation is applicable. To get the age relaxation info you have to visit the official Notification. Also, visit the Railway Recruitment Board’s official website regularly. So, coming to the Education Qualification details, all the aspirants those who have done their Three Years Diploma from any recognized University or Board are only eligible to apply for RRB JE Recruitment 2018-2019. Before starting your application process, all the competitors need to find the Eligibility Criteria first. Moreover, this is the great job opportunity for the people those who had successfully completed their Diploma. Many of the diploma candidates are in disappointment. Because there are unable to find the proper Education Qualification. So, follow the current article and apply for Railway Junior Engineer Recruitment 2018-2019 as early as possible. After the closing date of application forms will be acceptable. To avoid the last minute rush it is better to apply on or before the closing date. Across India, the Railway Recruitment Board is planning to release the RRB JE Recruitment 2018-2019. Surely, this is a golden chance for all the job aspirants who are looking for the Central Govt Jobs. So, the selection of the candidates is purely based on the Written Exam and Document Verification. Aspirants are suggested to prepare well in order to secure the minimum marks in the test. Only those candidates who will secure the Qualifying Marks in the written test are only allowed to attend for Document Verification. All the selected candidates can receive the best pay scale from the Board. Also, before submitting you have to pay an Application Fee. The Fee is different for category by category. So, take a look at the Official RRB JE Recruitment 2018-2019 Notification carefully to get the Fee Details. Also, check the payment Details thoroughly. The Railway Recruitment Board is strictly specified that only those contenders who had down their Three Years Diploma in any recognized university/ institute are eligible to apply for RRB Junior Engineer Recruitment 2018-2019. Get the impressive Pay Band along with Grade Pay from the Railway Protection Force. Aspirants need to check the Official RRB JE Recruitment 2018-2019 Notification thoroughly to get the Application Fee/ Examination Fee dinformation. And also at the end of this post, we have attached a direct Notification. So, click on the link and easily find out the Application Fee details. The Age Relaxation is applicable as per the rules and regulations of candidates. Well, coming to the selection procedure details, all the aspirants must and should face the following rounds. 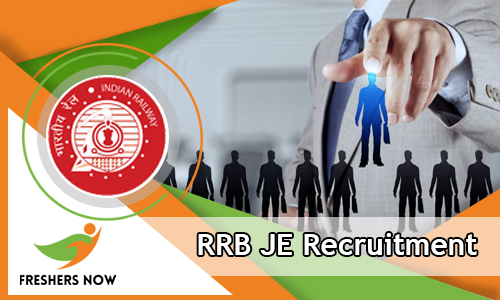 As soon as possible the RRB JE Recruitment 2018-2019 is available. So, we advise the job seekers to check the above-given details very attentively and apply for RRB Junior Engineer Recruitment 2018-2019 before the end date. We are sure that the freshersnow.com is the genuine platform. And also, bookmark the current article so that you don’t miss even single topic also.